We recently went to Snibston a museum of discovery in Coalville, Leicestershire, it is run by Leicestershire county council. We decided to go here as one of the kids went on a school trip and she said is was good so we thought would be a great place to visit for a family day out. Entrance cost is £7.50 Adults, £5.00 Children, £22.50 Family (2 + 2), though if you go to the official website HERE and download the leaflet and print it out you have a voucher for 2″ “0% off admission price. Parking is free on the site and there is ample parking. There is also a small indoor play area for under 5 kids, with a little tunnel to run through, to the side of this you have the light fantastic room with all different things to do with lights from a large plasma ball to an interactive floor that has you move over it changes pictures or interacts with your movement like moving lily leaf plants around a pool as the water moves, or even making a picture like a jigsaw puzzle. Next to that is the toy box, this has displays of older toys, again this brought back some memories from my childhood even thou I’m only 38 i can remember a lot of the items in the displays as well there are a lit of toys and games from older generations of mine. There is the transport, engineering and extractive industries gallery here you have all type of transport from two Auster light aircraft, buses, cars etc there are also displays of building inc how a coal mine works, there is also a small tunnel that kids can go through that looks like a coal mine. Some of the exhibits are fully interactive, the kids did enjoy this part. Then there is the fashion gallery, this has displays of clothes and outfits from all different periods, My partner and the girls really enjoyed this section as so much to look at. you can also pose under different colour lights to see how your clothes look under the different colours and take photos, also different things to do with fabrics, inc design your own weave. Outside there is a large play area with all different things to do one is a water display were you can open gates and see the water flowing around and into sections, the kids can get a bit wet playing on this, so probably not great if the weather is not warm. There are also loads of other interactive items to play with,myself I like using the sound domes, were some one at one dome can say something and the person the other end can hear you clearly. When we went there was the Colliery tour on, this you do have to pay extra for upon entrance, though is only £2.10 adults and £1.30 children. The tour guide was Henry who used to work in the pit, when it was open. The tour last about 45 minutes, Henry tell you about the mine and how thing work, you go into the control centre and see all the masks and air supplies, you can have your photo taken with mining equipment. The final part of the tour is a reconstruction of what a mine would be like, you have to wear hard hats and have torches, be aware the ceiling is low so be careful, The guide shows and tells you about the mine and how dark it would be without any light, there is also some effects of what an explosion would be like unfortunately the day we went it didn’t seem to work fully. 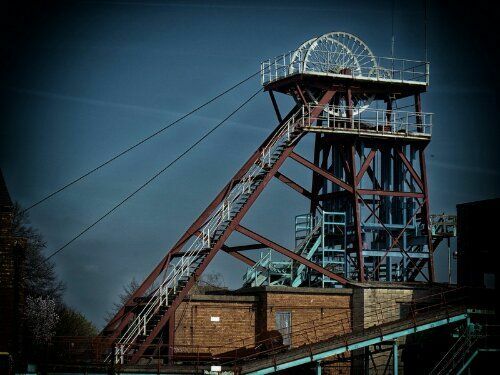 I would really recommend going on the Colliery tour as it is very informative and both adults and children alike will enjoy it. We really did enjoy the trip to Snibston discovery museum, as there are loads of things to do and see, you could easily spend the whole day there, opposite the mark museum is also a country park of the Grange nature reserve, we didn’t go there but does look good if you like nature walks etc. So Snibston is a great place to visit and I would highly recommend a visit as the entrance cost is good for what is in the attraction.